While calling for less fighting between Republicans and Democrats, President Obama also sent a message last night to critics -- the so-called "birthers" -- who say he was not born in the United State (and is therefore ineligible for the presidency). "I was born in Hawaii, what can I say?," Obama told Democratic donors in Boston. "I can't change those facts." As Obama and the Democratic Congressional Campaign Committee raised $1 million, Obama also trotted out theme we'll likely hear all the way through the 2012 presidential election. "We didn't just rescue the economy we put it on the strongest footing for the future," Obama said. "And along the way we saved the auto industry and a few other things." Obama noted that when he took office, "this country was going through as touch a time economically, as tough a time financially, as any period since the 1930s." As a result, he said, his administration "had to make a series of quick decisions, and often times unpopular decisions." 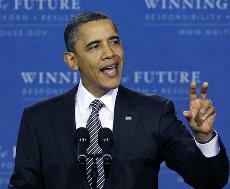 The president also said he has fulfilled 2008 campaign promises to end combat operations in Iraq. While pledging to cut the budget, Obama said he will not stand for cuts in education and other essential programs. The United States should not be about the "haves and the have nots," Obama said. "That's not the America that I envision for (daughters) Malia and Sasha," Obama said. "And so we're going to have a lot of work to do."